It has been designed to revisit countable and uncountable nouns and to express likes and dislikes about food. 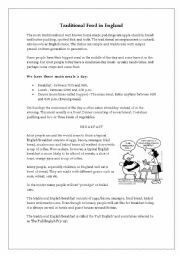 It is a reading which contextualizes both lexical and grammar issues together with cultural traditions in England. 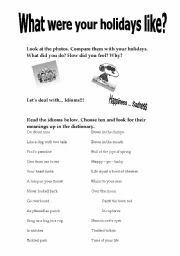 It´s a nice icebreaker worksheet to use it the first day at school in order to know you students more. I´ve chosen this song because I´m a believer that teachers can do a lot for their students even if they tend to show that English isn´t important in their lives. Hope it works! 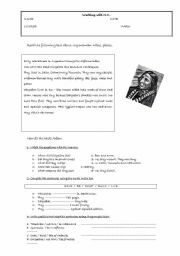 Stepping on CLIL is a reading worksheet about Argentinian Tribes which deals with vocabulary and grammar tasks. It´s a gorgeous worksheet based on Margret & H. A. Rey´s Happy Easter, Curious George retold by Silvia. The video can be downloaded from YouTube, this is the link https://www.youtube.com/watch?v=4ATdGIp4V- Hope you like it! Regards! This song may be used to revise a whole year class vocabulary as well as grammar. It may be a way of working with feelings and emotions to finish a term. 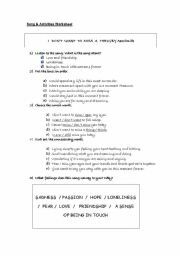 Enjoy watching the movie with your students and end up the activity working with this easy - going worksheet, especially designed to elementary learners of English. Deal with vocabulary and short texts to improve reading comprehension skill with your students. Have fun! On Friday I´m in love was and is still a hit in the world of music, especially for those who love the 80´s!!! 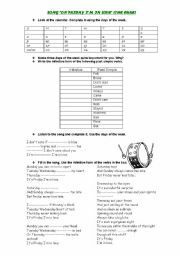 I took advantage of this song and worked with the days of the week and past simple verb forms and they really worked! please try it! 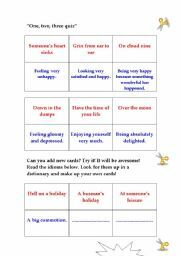 it´s such a catching activity that your sts will enjoy it a lot... Hope it works! 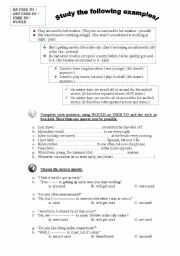 a practical worksheet to notice the difference among used to / be used to / get used to and would when used in the past. I hope to be useful.